Heavens Declare, Inc. was formed for the purpose of providing lectures, presentations and instructional materials to the general public and the educational community, with a Biblical Christian perspective on science and more specifically on astronomy. 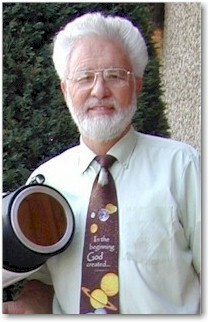 The founder, James Burr, has presented lectures on Astronomy from a Biblical Perspective to thousands in churches, youth groups, elementary and high schools, colleges, universities, retirement centers and home-school associations in the U.S. and Russia since the early 1980s. He has also appeared on many international satellite feeds from Three Angels Broadcasting Network (3ABN), Hope Channel and Loma Linda Broadcasting Network (LLBN). Jim is recognized throughout the world for his achievements in telescope design and manufacturing and his design patents for astronomy accessories. If you would like to have Mr. Burr give a presentation to your group, please Contact Us. Lecture dates may be limited. NASA / ESA / S. Beckwith (STScI) and the HUDF Team. Jim Burr's response to the Bill Nye and Ken Ham February 4, 2015 debate on the question, "Is creation a viable model of origins in today’s modern, scientific era?" The heavens declare the glory of God; and the firmament shows His handiwork. By the word of the LORD the heavens were made, and all the host of them by the breath of His mouth. Let all the earth fear the LORD; Let all the inhabitants of the world stand in awe of Him. He has made the earth by His power, He has established the world by His wisdom, and has stretched out the heavens at His discretion. Blessed be the name of the LORD from this time forth and forevermore! The calendar was last updated Sunday, March 17, 2019. FREE and OPEN TO THE PUBLIC are marked with (PUB). Jim is available for lecturing on cruise ships for 3 to 7 days and up to 14 lectures per trip. Radio 74 Radio Broadcasts . Jim has recorded 31 programs for broadcast on Radio 74 stations. These program will also air on Family First Radio. They are titled "Heavens Declare is On the Air." 3ABN can be viewed via Broadcast Stations (limited areas), Cable (limited areas), Satellite or the Internet. Programs which feature Jim Burr are broadcast intermittently on 3ABN. Check the on-line published schedule for future broadcasts. Currently (2016) Jim has a series that is running throughout the week. Watch here for updated information which will be published as soon as it becomes available. HOPE Channel Satellite Broadcasts . Hope Channel can be viewed via DIRECTV, the Internet and other networks worldwide. Jim Burr was featured in a phone interview during the one-hour World of Hope program. The program was aired on Friday, October 23, 2009, at 6:00 pm Mountain Time and Saturday, October 24, 2009, at 4:00 am and 4:00 pm Mountain Time. Repeat airing times are unknown. LLBN can be viewed via FTA* channels on the Galaxy-19 and Thiacom-5 satellites or via the Internet. To purchase any of these programs, contact LLBN. A two-hour program broadcast live on Tuesday, September 21, 2010. Any repeat broadcasts are unknown at this time.